Figure A10. Arafura anomaly, interpreted as the Arafura slab, with (horizontal) [vertical] cross sections through (A)[D] the UUP07 p-wave) and (B)[D] the combined SL2013 and S40RTS s-wave models at 590 km; C) the location of the modern geological record that we interpret to have formed during the subduction of the slab. The Arafura anomaly (Figure A10) was defined corresponds to anomaly A6 of (Hall and Spakman, 2002; 2004). It is interpreted as a NNW-SSE trending slab, flat-lying at the top of the lower mantle and the base of the upper mantle from north of the Bird’s Head, beneath the Arafura Sea, to the Gulf of Carpentaria. Towards the north, the Arafura slab is in the vicinity of the base of the Halmahera slab that started subduction around 15 Ma, suggesting that the Arafura slab should be correlated to a subduction zone that terminated east of Halmahera in mid-Late Cenozoic time. Hall and Spakman (2002; 2004) interpreted the slab as the result of northward subduction underneath the Philippines-Halmahera arc between 45 and 25 Ma. The geological record of this Paleogene subduction zone is, according to the reconstruction of Hall (2002), now found on the eastern Philippines. Wu et al. (2016) interpreted the anomaly to be an East Asian Sea south slab, being the result of southward subduction underneath the Solomon Sea between 50-20 Ma. 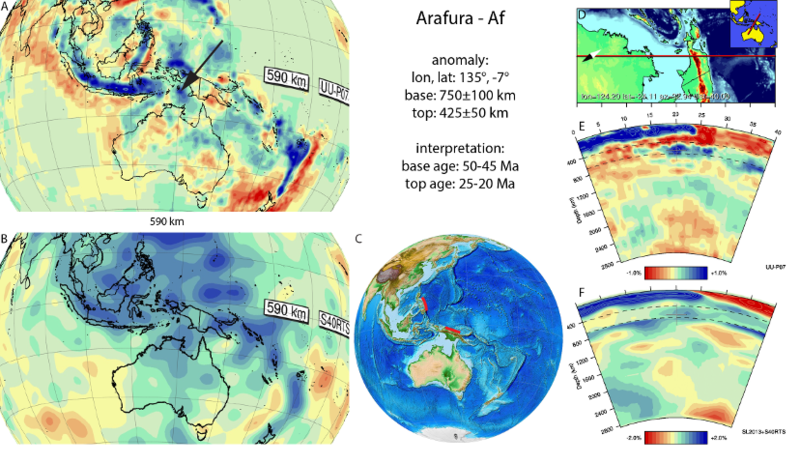 Both interpretations are consistent with the modern position of the slab and we therefore adopt 50-45 Ma and 25-20 Ma as age ranges for the base and top of the Arafura slab.